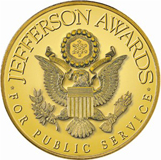 Furlong Vision Correction was awarded the Jefferson Award in 2011 for the Gift of Sight Program. 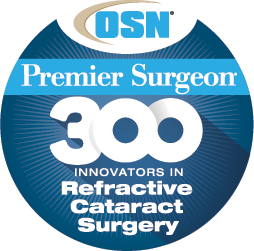 Dr. Furlong started the Gift of Sight program in 2002. 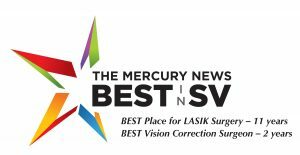 This annual, charitable program provides consultations, Advanced Topography-Guided Custom LASIK and Photorefractive Keratectomy (PRK) procedures and post-operative appointments at no cost for up to 10 deserving individuals in strong need of vision correction. 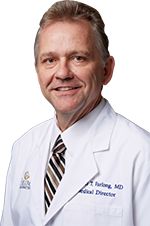 Since launching the program, Dr. Furlong has provided services to 149 recipients, donating more than $950,000 in procedures. 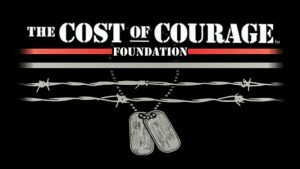 This year, we worked with Kelly Estes and The Cost of Courage Foundation to identify military veterans who would benefit from this program. “The Cost of Courage Foundation supports the educational and personal needs of deserving military veterans in our community to ensure a successful transition back into civilian life so this is a great partnership with our Gift of Sight program,” said Dr. Furlong. 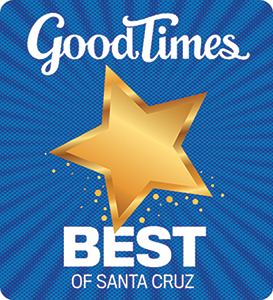 We also work with our optometric partners to identify possible recipients and this year, we had two patients submitted by Dr. Ted Bailey, Plager Vision and Optometric Center in Santa Cruz. Watch the 2016 Bay Area Proud story by Garvin Thomas on NBC. Here are great videos from our 2017 Gift of Sight recipients. Hank Provost served in the Air Force from 1974 to1981 as an electronics technician trained in solid-state theory. As a Communication Commander, Hank was in charge of a squadron of 500 at Keesler Air Force Base in Mississippi. Hank was drafted while attending Kent State, becoming an activist after the Kent State massacre. He also protested the Iran hostage crisis, taking 52 American flags and one Canadian flag and stationing himself in front of the Buffalo News station and generating coverage on the Buffalo Evening News. At the time, he was stationed at a top-secret facility in Niagara Falls that had access only by the commanders and the President of the United States. His base commander also supported his protest. Hank worked at a subsidiary of Lockheed in top-secret communications for the shuttle program. He eventually settled in Gilroy, Calif. with his wife and two sons. He and his wife owned a women’s lingerie store but his life changed when environmental health problems affected his son’s health. He eventually lost his home, business and marriage and is now at the Veteran’s Housing Facility in East San Jose. 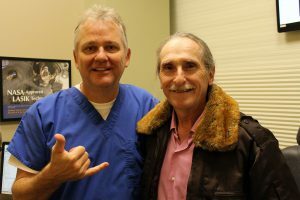 Hank was so surprised at how painless the surgery was and said that an eyelash in his eye was more painful! Hear Hank’s story about serving seven years in the Air Force and now loving to roller blade without his glasses! Ilga Hernandez, 26, was legally blind without glasses or contacts. Ilga is a Santa Cruz native who lives with her mom and currently takes courses at Cabrillo College and is applying for some Radiology programs. She is also a barista and shift lead at Marianne’s Ice Cream. Growing up, she was very shy and afraid to speak up in the classroom as she couldn’t see the board even when sitting in the front row. Playing sports was a big challenge especially basketball and swimming. Ilga loves to sing and is a member of Pacific Voices, a non-profit community choir in Santa Cruz. One day after her surgery, she said that she could not express how much it has already changed her life. “I’m so excited!” Listen to Ilga’s story and her excitement of getting rid of glasses! Past partners in the program include Team Red, White and Blue, Hope Services, The American Cancer Society, Diabetes Society of Santa Clara County, Valle Monte League, Junior League of San Jose and Make-A-Wish Foundation have been past partners of the program.